Medieval Definition. What was Middle Ages? The era of the Middle Ages (medieval period) in Europe was an extensive period in history, starting from 500 AD until 1500 AD. In these 1000 years time frame, mankind saw the rise and fall of many Empires. It was a period of castles, monasteries, cathedrals, guilds, peasants, nobles, poets, painters and crusaders. Middle Ages celebrated art and culture that originated from the ancient lands of Rome and Greece. Life in the olden period of Middle Ages revolved around castle system and hierarchy. It was like a pyramid structure, wherein the royalty were placed at the top and the peasants and the poor people were at the bottom. Between the famous royalty and the unfortunate peasants, the elite rich nobles or lords acted as middle-men, and gained prominence and privilege in the society. These nobles were the ones who provided employment, land resources and protection to the poor peasants. 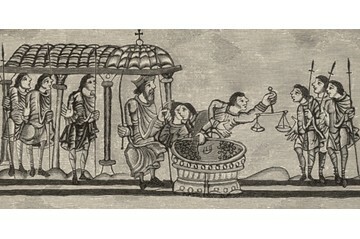 The nobles or lords also offered supplies, funds and military services for the King. Nobles enjoyed a good life. They indirectly ruled the peasants according to the feudal system of those times. Most of the common people and peasants were indebted to the lords, and had to obey them under such conditions. Nobles or lords often engaged in fun social affairs and parties. The responsible nobles focussed on fulfilling their financial obligations and building their military strategy for the King. To gain the status of a nobleman, one had to be born in a noble family. The nobles of Middle Ages were referred to as ‘Blue Bloods’. This title was given to them by the royal family to honour their loyalty and services. Under the rule of the King, victorious conquests during war or great display of bravery, valour or special skills could elevate the status of an entire noble family. The nobles were given notable and regal titles such as Count, Duke or Lord. The High Middle Age period that began after some 1000 years saw the massive rise in Europe’s population due to the technological, agricultural and medical advancement that helped flourishing trade and land businesses. The warm climatic conditions during the High Middle Ages also saw better crop yields. The society was initially organised in two different ways during this time. Manorialism – The assembling and organising of the peasants into various villages, which were rented out to them in exchange for their labour services. Feudalism – The hierarchy political structure where the knights and lords came together to offer their military services to the high ranked nobles, in return to earning rent from the village lands and manors. The crusade was a term preached and practised by the Western Europeans with Christian faith, to regain control over those lands that had Muslim rulers. This saw the unity of many Christian rulers called as Christendom. The intellectual scholars were revered and many educational universities were founded. From the majestic paintings of Giotto, the poetries of Dante to the wondrous Gothic architecture and extensive travel and trade, the High Middle Ages was a busy and exciting period. The late stage of Middle Ages was distinctly marked by numerous calamities and wars. The holy land was almost destroyed by famine, plague and constant wars. Between the periods of 1347 to 1350, diseases claimed many European lives. It was known as period of Black Death. However, late Middle Ages also witnessed peasant revolutions, technological developments and cultural progressions that laid foundation to the beginning of an early Modern Society. The Middle Ages is one of the most interesting eras in the European history. Medieval writers and literary scholars divided history into different periods like ‘Six Ages’ and numerous empires. They seriously considered that the end of the world was near, after their time. In the year 1330, poet Petrarch believed the pre-Christian periods to be ancient and the Middle Ages Christian period to be new or modern. The Middle Ages was first mentioned or written about in the year 1469 as the middle season in the Latin language. The alternative term for Middle Ages as ‘medieval’ was sourced from the Latin term ‘medium aevum’. Later, the 17th-century German historian called Christoph Cellarius divided history into three main sections namely; ancient, medieval and modern history. Some Roman historians segmented the great Middle Ages into two parts; a High period and a Low period. While the English-speaking history scholars sub-divided the medieval times into three part; early, high and late. During the 19th century, the whole period was referred to as the Dark Ages, while the modern historians termed it as Early Middle Ages.